In the Netherlands, a national project has started that aims to make available the scientific output of all Dutch scientific organizations according to the Open Archives Initiative protocol. 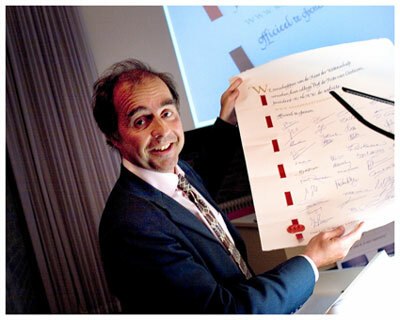 On 10th May 2005 the president of the Netherlands Academy of Arts and Sciences (KNAW) Prof. dr. Frits van Oostrom launched de website www.creamofscience.org. It was the result of months of very hard work for the project 'Keur der Wetenschap' (Cream of Science) at all Dutch university libraries, KNAW and also at CWI. They were each asked to put the complete scientific output of about ten active scientists in a repository. This project is part of the national project DARE (Digital Academic Repositories). DARE aims at stimulating so called Institutional Repositories (IR) in the Netherlands. These IRs aim to make available the scientific output of all Dutch scientific organizations both digitally and according to the international OAI - Open Archives Initiative - protocol. Copyright was an important issue for many participating libraries and authors. Is it proper to publicly present publications without the author's permission? DARE investigated this matter and it turned out that all material dated before 1998 can be admitted to repositories without legal restrictions. Research also showed that authors often do not know that signing the author-publisher agreement means that they give away their copyright to a commercial publisher. DARE partners dealt differently with publication dated from 1998. Some only recorded the metadata from publications of that period whereas others recorded all publications, often at request of the scientists. Prof. Dr. Frits van Oostrom launches Cream of Science (Photo courtesy of Theo Koeten Photography). On behalf of NWO (Netherlands Organisation for Scientific Research) the CWI Library takes part in DARE. It will also host the output of the other NWO institutes, although each institute will be responsible for their own input. The CWI-IR can be found through the Keur website or at www.darenet.nl, where also some CWI reports of the past years can be found. In the near future an interface will be installed on CWI-IR, which can be searched separately. Gradually the publications of all past and present CWI researchers will be put in the repository. CWI emphasizes that participation in Keur der Wetenschap is very useful as a start for an Institutional Repository. Eventually the importance of an IR according to the OAI protocol is to be found in the possibility of subject-based 'harvesting' by international service providers.